The success of the Foundation for Faith campaign relies on you, the St. Mary's Church community. Because the goal of this campaign is to raise $1.5 million, please know that your gift of any size does matter. Gifts to this campaign can be scheduled as one-time gifts, or gifts that span over a period of two years. Please take a moment to prayerfully review the suggested gift commitment plans listed below. There will be several opportunities for donors to make a gift commitment in honor of or in memory of a loved one. Details on these opportunities are forth coming. Schedule an appointment with Fr. Tuan to discuss your gift. To schedule an appointment, please call 815-467-2233 ext.103 or click here. Make your gift online by clicking here. 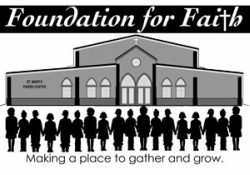 If you have any questions about supporting the Foundation for Faith campaign, please complete the items below and a member of the campaign committee will follow-up with you.